Christiane Amanpour's ratings on This Week are generally not impressive. Could it be that hair? One women's group proposes a solution (and it's not a haircut). 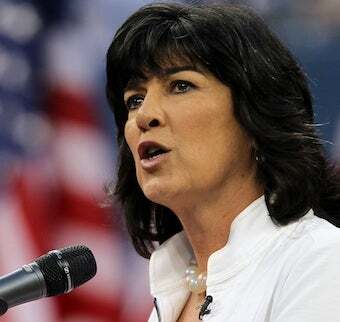 Conservatives, who rather arbitrarily see Amanpour as a terrorist sympathizer, were crowing at the news that on September 19, the show had its worst ratings since 2003. Of course, these numbers are often an elaborate manipulation. ABC News sent a press release crowing over Amanpour's excellent October 3 ratings, but mentioned only in passing that the usually dominant Meet The Press wasn't even on that week because a sports broadcast was on. Unfortunately, we're on the verge of losing two women whose expertise represents the perspectives of 51% of the population: Christiane Amanpour and Katie Couric. Despite Amanpour and Couric's innumerable accomplishments, expertise, and conscious efforts to have as many women as men on as guests, their shows have experienced poor ratings this summer. And ratings drive decision-making at the networks. Simply put, there's one way to support these inclusive women anchors: watch their shows! The Center is also suggesting that watchers chime in on Facebook and on Twitter with the hashtag #WMCWatchIn. Technically, this is only effective if people in Nielsen households participate, but it can't hurt to make a little noise — not because Amanpour's ratings necessarily have to do with her gender, but because a network that gets commercially punished for breaking the homogeneous mold is not likely to "take a chance" again.